Even the most renovated bathroom can send your house guests home with an icky feeling if not kept looking clean and germ free. Here are a few problem areas for bathroom cleanliness that should be taken care of regularly. 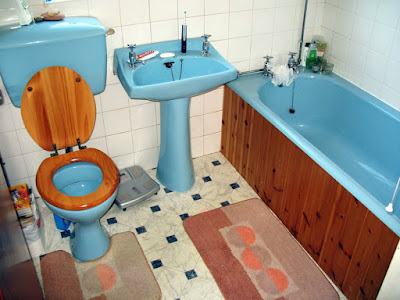 The toilet is always the first fixture in the bathroom to get grimy. It's easy to procrastinate cleaning the toilet, but it just gets harder and harder to clean. The best practice for cleaning the toilet is to do so regularly as to not let germs and grime build up. Be sure to use gloves and to clean toilet brushes after every use. Following these rules will keep you safe and your toilet sparkling. Brown or dingy bathroom tiles and grout can automatically make your bathroom appear nasty. Grout is hard to clean once dirty, and breeds bacteria due to its porous nature. Wash and change hand towels regularly to prevent bacteria growth. Moist hand towels can spread bacteria to everyone who touches them. Sink build up and soap scum is definitely gross. Not cleaning sinks can cause moisture build up and rust damage to expensive bathroom sinks and counter tops.